So in fall 2018 a new title by Rockstar (the developers behind the infamous Grand Theft Auto series) released their new project. Red Dead Redemption 2, a sequel to their first Red Dead title released 8 years ago on the XBOX 360/PS3 generation. 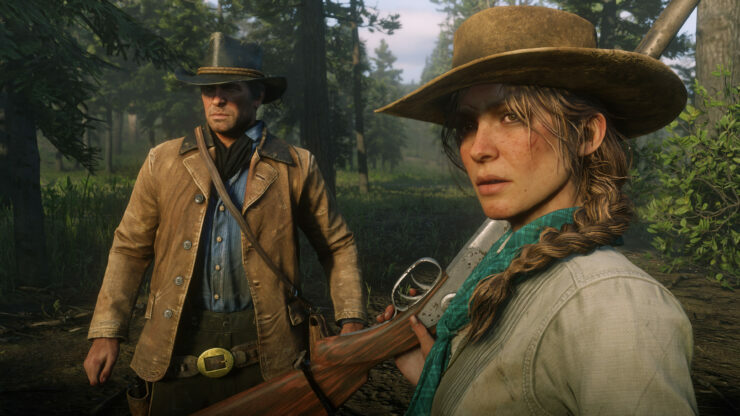 They had been working on the sequel for 8 years which to me is a good thing, not only because the first game was so good but because RDR2 is amazing. I won’t go into too much details on the premise of the game, there are enough reviews and blogs about the title that if you want to know more Google can help you, in general though the game is an open-world title set at the turn of the century. Cowboys, robbers, villainy… that sort of thing. I really enjoyed the title, I upgraded our XBox One S to the XBox One X and RDR2 runs very well on the X in 4K. The HDR support is pretty bad, enough so that I turned it off on the console but the game is so pretty and believable that HDR off didn’t impact the visuals in the game. What actually stands out about RDR2 isn’t visuals, it’s how the game world is so seamless. Often playing sandbox games you can see the hole in the game, where the AI or gameplay or activities feel ‘gamey’ or clunky but RDR2 didn’t have that feeling. It plays more like a ‘cowboy simulator’ as opposed to GTA set in cowboy land. What also really stood out for me were all the random events that happen in the game. Strangers met out on the road, fist fights that break out in the saloons, people asking for help that you meet organically playing the game. Some of the controls and aiming in the game aren’t perfect, some of these issues are likely due to all the animation they implemented in the game but none of this was something that I couldn’t live with. I didn’t get too much into the online option of the game, after finishing the single player story clocking at 97 hours, I felt I got what I wanted out of the game.